With 12 luxurious rooms boasting private plunge pools overlooking a riverbed - offers the chance for a romantic break at a surprisingly affordable price! Each suite has its own private plunge pool so you can just chill out in your own suite during the heat of the day – perfect for honeymooners! We really enjoyed the food here – especially that there was usually a delicious venison option on offer! sitting back and chilling in your private plunge pool or your romantic antique bath snacking on canapés while watching the elephants stroll by has to be one of life's greatest pleasures! The Kruger National Park is world renowned for good reason – it offers a superb game experience with high densities of a wide variety of animals. 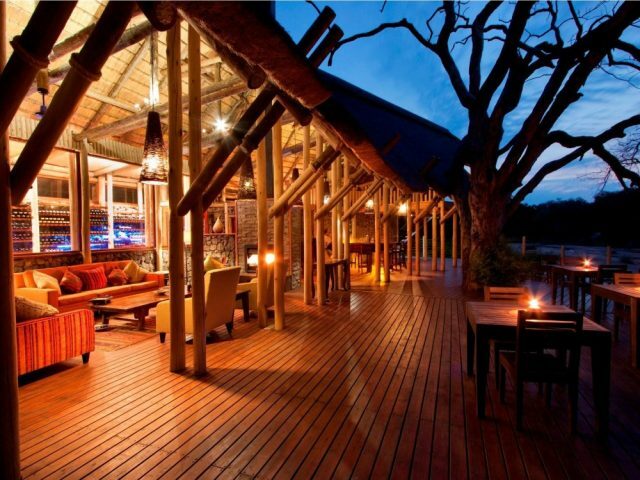 The problem is that most of the Park's accommodation options are overly basic and frankly unattractive – the alternative therefore for bush fans wanting a touch more comfort, sophistication and style is to stay at one of the private concessions where the lodges are a lot more luxurious and the experience far more personal and upmarket. The flipside of the equation is that these private lodge concessions are also usually quite a bit pricier – which makes Imbali an attractive option as it is one of the more affordable of these private lodges whilst still being situated in a prime game area! Imbali lies centrally within a10 000 hectare concession area in the central area of the Kruger, roughly adjacent to the Manyeleti Reserve – an area known for its concentration of plains game and the big cats that go along with that. The lodge enjoys a very attractive location on a shaded riverbank overlooking the N’waswitsontso riverbed with the surrounding savannah of rolling grass land scattered with shrubs and isolated trees. 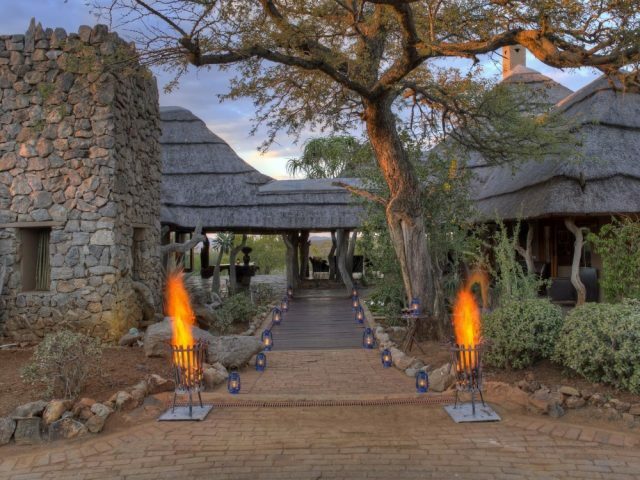 Imbali Safari Lodge shares the concession with its two sister camps, Hamiltons Tented Camp and Hoyo Hoyo Tsonga Lodge which offer completely different styles and experiences – in fact it may be a great idea to split your stay between Imbali and one of the other lodges! 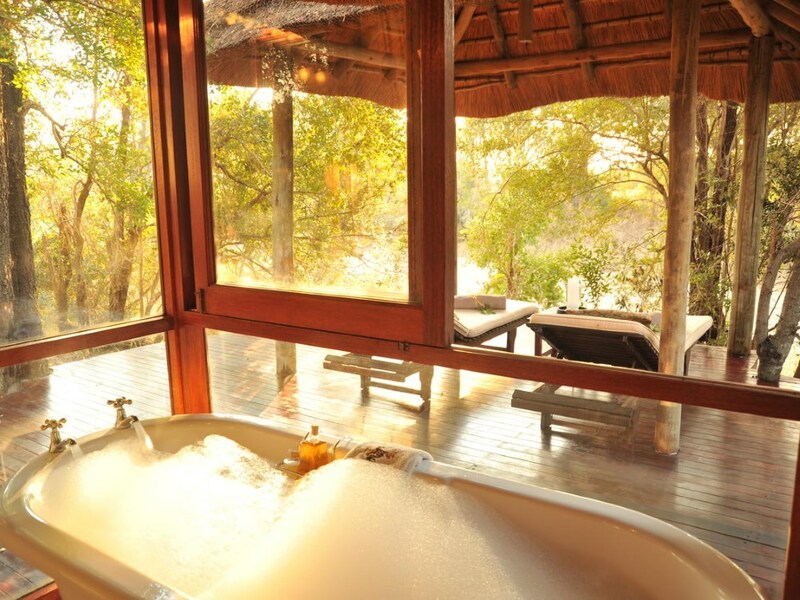 If you are looking for privacy this is the place for you - Imbali offers accommodation in 12 spacious individual chalets, arranged in a row along a seasonal river either side of the main lodge. The rooms are bang up-to-date and each suite is spacious and luxuriously furnished. The room (& bathroom) all have a direct view of the river bed and needless to say you will have some excellent sightings from the comfort of your room – whilst we were there we enjoyed watching ellies feasting on some tasty lush grass on the riverbank right in front of our room (with just the protective perimeter fence separating us). 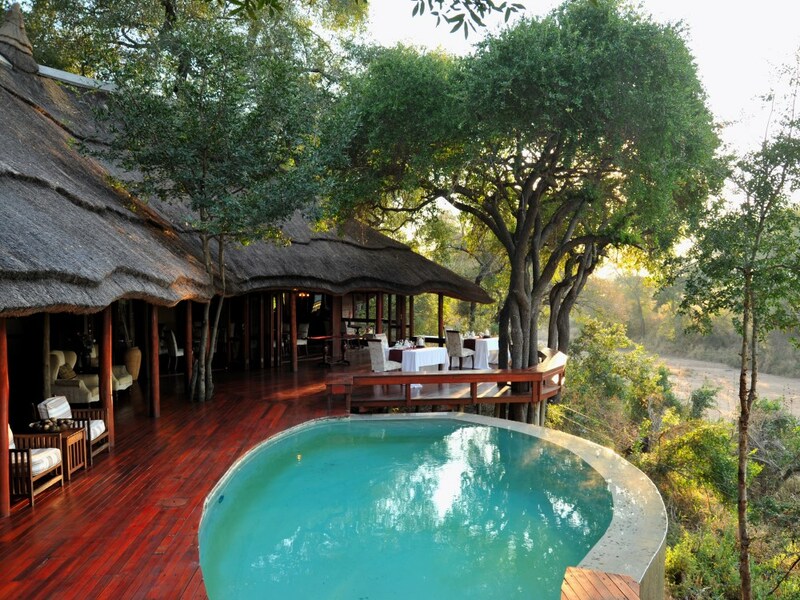 And best of all is that you have your own private wooden viewing deck complete with your own private plunge pool! The most attractive feature of the main lodge has to be the gorgeous deck area where most meals are enjoyed which lies directly opposite the waterhole on the far bank of the river, so you can watch the parade of animals to and fro whilst tucking into your food (and whilst we were there we found the food to be really tasty – we also enjoyed the fact that there was usually a venison course which is becoming increasingly rare at many game lodges today) Interestingly for the history fundis, the construction of the main lodge had to be delayed because of the discovery of an archaeological site – a process that has now become attractively incorporated into the design of the lodge itself with artefacts and old bones and the like on display. Game drives are conducted in open 4×4 vehicles with experienced and informative rangers - one thing to note is that whilst you are able to go offroad on the concession's own road network for Big Five sightings, on those drives which utilise the park's road network you 4x4 has to stay on the beaten track. The “Talamati Pride” of lions are frequent visitors to the waterhole and the immediate area around the lodge, and the chances of seeing these big cats is excellent. After the early morning game drive you can retreat to the comfort of your room where you can relax on your sun loungers taking the occasional cooling dip in your private pool. And if even that sounds like too much hard work, why not take up the opportunity to have the resident Spa therapist give you a relaxing massage in the comfort of your own room! Children from the age of 6 years are welcome at the lodge. Children 6 - 12 years are permitted on game drives only at management discretion. 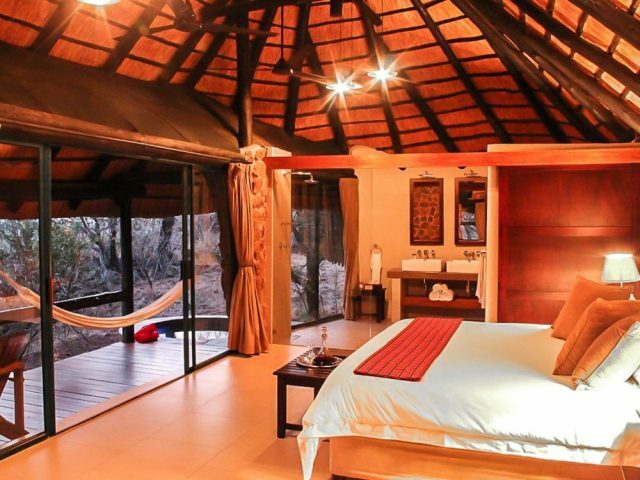 Take in the gorgeous views of the Lebombo mountains from the private plunge pool or hammock on your deck at this 8-room lodge offering excellent value for money! Cool off in the heat of summer in your own private plunge pool; in winter return to the warmth of your Morso fireplace heated room! An attractive and charming camp in a scenic riverbank location on a prime Kruger concession just north of Skukuza – attractive and luxurious yet understated!